Having spent 5 years working from home and raising the kids I am not ashamed to say that one of the things I love about my new corporate job is getting all dressed up again. My go to is a beautiful silk shirt - they are easy to slip on, look good with almost anything and even in the searing Sydney summer heat, if they are 100% silk, they are still a failsafe option. However, if you wear a silk shirt each weekday you either have a very high dry-cleaning bill or a lot of delicate washing to do! I choose not to dry clean my silk - not only is it expensive, I feel that I often get silk items back with a funny shine to it that I just don't like. So here is how I wash my silks at home. The first thing I do is run a "Rinse & Spin" cycle through my front loader washing machine with nothing in it - this just cleans the washing machine and removes any residual strong detergent used for previous washes. 20 minutes is more than enough time. I remove all the makeup, pen marks or other stains I find on my shirts at the end of a long day. My solution is cheap & cheerful (over 125 years old and less than $1 a bar); it is not glamours but boy does it work! I use some water and rub a cake of Sunlight Soap on the stain and then rub the fabric together lightly in a tub of luke warm water to remove the yellow of the soap (some of the stain comes off at this stage too). I try to do this for all my items just a few minutes before putting it all in the wash as I don't want the yellow of the Sunlight Soap to leave a mark (so far I have never had that problem). I wash my whites / light colours together and any blacks / dark colours in a separate wash. Once I have removed all the stains I pop all the silk, synthetic or other delicate items into our front loading washing machine (I, personally, would not use a top-loading washing machine for delicate silks, unless it is one of the new ones without a piece in the middle of the drum. I have just found that the structure in the middle of the drum can pull delicate items and ruin the garment). I've found success setting the water at 30 degrees celsius and the spin speed at 800 rpm for about 45 minutes. Have a play with your settings to see what gives you this combo - I seem to need to use the "Sports" setting. The 30 degrees give a little warmth to help with stain removal, however it is not too hot to ruin the shirt. If you have any particularly delicate pieces or pieces with structure I recommend using The Laundress mesh bags (they are bigger than the washing bags from lingerie stores so can fit a couple of shirts) to protect them. I love The Laundress' Delicate Wash for my silks. It is a bit more expensive than a regular washing liquid, however for my special pieces it is worth the splurge (you can buy it online straight from The Laundress in NYC or try Peters of Kensington or The Butlers Trading Company to purchase locally). I poor the liquid over the top of the clothes (rather than into any liquid dispenser built into the machine). I just hang my items on a small airer (from Ikea) with plastic pegs. If you wanted you could hang on a coat hanger, however I find the peg marks come out easily when ironing. Top tip: do not hang outside in the sun. Unlike cotton, silk hates the sun - white silk turns yellow, coloured and black silk fades and all silk suffers! I learnt this the hard way. 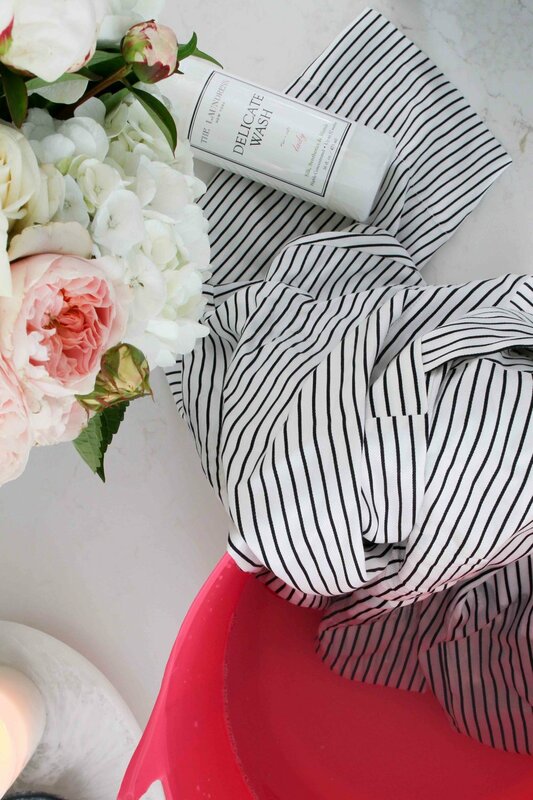 have just worn your silk top for a couple of hours, as opposed to a full day, spray a little The Laundress Delicate Spray, pop back in the wardrobe and save yourself a wash!